What makes up a fairy garden? It’s really only limited by your imagination, but in general a fairy garden can be limited to a small area or container of some sort, or as part of your main garden or as a feature in an existing area. You can buy a beautiful tub, half barrel or similar, or get creative with sinks, tin bathtubs, old tyres or large flower pots– there’s no right or wrong! It will need to contain some miniature plants either in pots or planted, moss, crystals, stones/pebbles, and perhaps a fairy house or two. It’s also possible to incorporate ponds, rivers, and accessories- there are manufacturers producing a wide range of amazing items to fully accessorize your garden, from miniture stepping stones and seats to swings and garden implements. Generally speaking the more unique the better- try beachcombing or countryside walks to find unusual objects, wood, rocks, fossils etc which might come in useful. It’s a good idea to have everything ready near where you will site your garden before you start so you don’t have to carry your creation to its new home after you have made it- depending on the construction they can be quite heavy! If you are using a deep container, you can half fill it with any kind of rubble, old styrofoam packaging works great, as it will aid drainage and stop it being too heavy. Then you need a layer of good quality potting compost almost up to the top of the container, but gently packed down as you will be planting into this. If you’re incorporating it into your normal garden bed, then it is a great idea to select a large old tree as your focal point, then grow the plans out from there. I usually select low growing plants, such as creeping thymes, stone plants, creeping rock plants etc. A good hunt around your local Wyevale Garden Centre you’ll be sure to find some treasures. Ask a member of staff for help if you’re unsure, but plants which do well in thin soil will often be a good bet. Next you want to position your fairy houses and main features, then remove them so you can put your plants in first. You may need more compost to firm everything up after you have put your plants in. I use fish tank gravel for paths as it’s small and colourful. I have also collected shells, pretty stones, tumbled glass and crystals and other little bits and pieces to go along the edge of paths. Try using a small bowl to make a pond, I prefer to buy fake moss as it looks more authentic and put garden furniture on the moss to make an outdoor scene. Small mirrors also work well as ponds and to reflect light into the garden. You will view your child’s Lego and dolls house furniture in a new light, these cute little pieces suddenly find a new life. As we recently renovated our house, we had many little bits and pieces we could use, recycle or reuse. As you get more confident, there are little bits of furniture you can make, seats, arches, lights etc. You can use fake flowers too so there is year round interest- many nowadays are so realistic that it’s hard to see the difference. If you’re using a fairy house, you can either make one, or purchase one- there are many models available nowadays in a variety of sizes, shapes and designs.Some of the houses are hollow, so you can put battery tea lights inside and the windows will light up. I’ve found some cheap vintage fairy garden miniatures online at http://www.cheap.forsale/fairy-garden-miniatures. 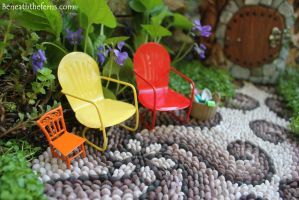 Making a fairy garden is a great way to spend time with your son or daughter, or even bond with the neighbourhood kids as it really encourages their imagination and it’s a way of letting them participate in an activity often reserved for adults. If you’re making the fairy garden in the front yard it will encourage a feeling of community in your street and the kids will feel involved and valued. Also, introducing children to gardening is educational – it teaches them about nature and the world around them, but also cause and effect, and a little bit about design – all great experience and knowledge for future life.